I loved this novel for two reasons: the main characters are original and believable and the plot is well-researched and engrossing. Minnie is adorable, and there is so much more to her than first meets the eye. She is very intelligent, cognitively as well as emotionally. She is beautiful, but scarred, physically and psychologically, although she gradually overcomes most of her insecurities as the novel progresses. The same is true for the male lead, Robert, The wealthy and influential Duke of Clermont. A complex and wounded character, who is burdened with someone else’s guilt. It is not a love story dominated by two characters. There are many more, believably portrayed, and we really get to know what makes them all tick. Minnie and Robert’s love story has plenty of dramatic and unexpected ups and downs as they are constantly up against seemingly impossible situations, which they are eventually able to overcome through understanding and forgiveness. There’s also a very realistic and unusual plot, dealing with social and political issues, as well as scientific advances, all in keeping with real events taking place in the Victorian era. I love well-researched and well-written, historical romances. It is a lot more than just a love story, and there’s a great deal of work involved in writing historical novels, as well as the author’s creativity. I know because I also write Victorian fiction, and although I find it liberating to write in another time-frame, I also find it requires a great deal of hard work to immerse the reader in another distant, world. You can be sure that this novel will transport you smoothly on an unforgettable journey to another time and place: early Victorian England. 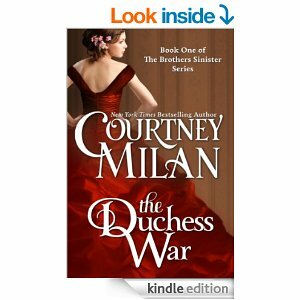 I was lucky enough to download a free copy, so I’d also like to thank the author, Courtney Milan for her generosity, and although it’s definitely worth paying for, it’s free at the moment, so what are you waiting for to download it? Sounds like something I would definitely enjoy – will add to my TBR list. Thanks for the recommendation!